Here's the second shot from my new portrait series. This one is of Ole Hansen, the driving force behind Hansen & Lydersen smoked salmon. 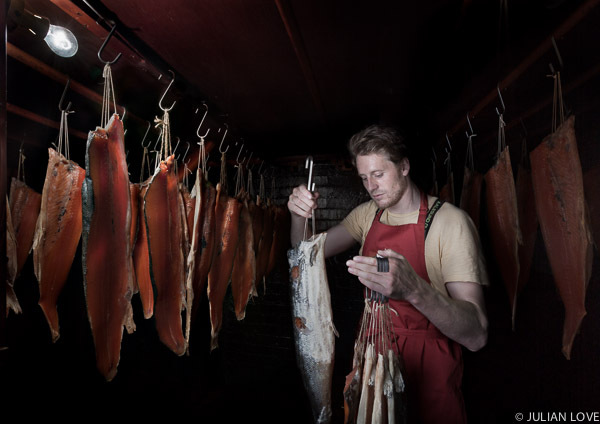 Ole is following in the footsteps of his great-grandfather Lyder-Nilsen Lydersen who set up a salmon smokery in Kirkeness in northern norway at the beginning of last century. His grandfather Leif Lydersen took over the reigns in 1962 and now, having skipped a generation, Ole has re-started the company here in London four years ago. He now supplies Selfridges as well as several top restaurants around the capital. Last week we visited him at his smokery in Stoke Newington and here is the result.